- Earlier this month the leadership of the German armed forces prevailed on the Kaiser to loosen his restrictions regarding the bombing of London; henceforth, it is permissible to target the city east of the Tower of London. Overnight the first bombing raid on the British capital is undertaken by the zeppelin LZ-38, which drops several bombs and killing thirteen people. No targets of any real strategic significance are hit, but the experience of being under fire is new to the city's inhabitants, and the raid also highlights the current inability of the Royal Flying Corps to stop such attacks. Of fifteen aircraft scrambled to intercept the zeppelin, only one so much as makes a visual sighting, while anti-aircraft fire is negligible; LZ-38 is never in any real danger. - In Artois elements of the German XIV Corps retakes the trenches north of the sugar factory west of Souchez, but the trenches on the factory's other flank remain in French hands. To the south, the French 5th Division of III Corps attacks between Neuville and a confused network of trenches to the north of Roclincourt known as the Labyrinth. In bitter fighting they are repulsed near Neuville, but are able to seize and hold the first trench line of the Labyrinth. - Overnight the Russians launch counterattacks all along the front of the German 11th and the Austro-Hungarian 4th Armies in Galicia. Those that fall on the Germans, and in particular X and Guard Corps, are particularly heavy, but fail to make any headway whatsoever. To the north, however, the Russians have more success. Attacking at 2am, elements of the Russian XIV Corps break through the southern wing of the Austro-Hungarian 8th Division, capturing the town of Rudnik and establishing a bridgehead three kilometres wide on the west bank of the San River. 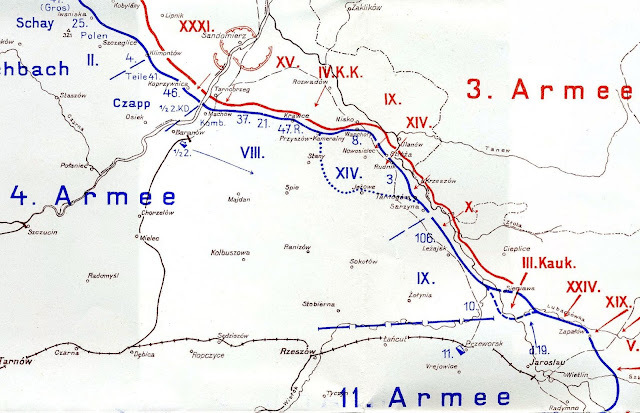 In response the commander of the Austro-Hungarian 4th Army pulls five battalions from VIII Corps to the northwest and sends them to south in an effort to hold the line. The advance of the Russian XIV Corps at Rudnik, June 1st, 1915. - In the context of the ongoing disaster in Galicia the Russian government is increasingly sensitive to criticism of its management of the war effort, and one perceived shortfall of the government has been the supply (or lack thereof) of munitions. To head off this line of attack, the government today appoints a special commission to supervise the supply of the army, implicitly diminishing the role of army headquarters in dictating the production of munitions. - North of Qurna on the Tigris River elements of 6th Indian Division hit the main Ottoman defensive line at Bahran, only to encounter token resistance; most of the defenders have already broken and fled to the north. General Nixon, arriving from Qurna, convinces a reluctant General Townshend to order a pursuit to take advantage of the success. By necessity the advance will be led by the naval flotilla assembled for the operation, and several gunboats lead the way up the river. Wilson is thus staking his position on the right of American citizens to travel as they see fit, without risk of death due to a war in which they are not involved. As the cabinet discusses the note, the Secretary of State, William Jennings Bryan, is increasingly restless. He feels that the American government is not being equally critical of the British, given that their blockade manifestly interferes with the ability of American citizens to trade as they saw fit. Moreover, he felt that if American citizens chose to sail on the liners of belligerents, they assumed responsibility for the consequences. Bryan's core argument is that the United States must treat Germany and Britain equally, and fears Wilson's note deviates from that position. As the discussion continues, Bryan snaps and interjects: 'You people are not neutral. You are taking sides.' President Wilson responds coldly to the accusation: 'Mr. Bryan, you are not warranted in making such an assertion. We all doubtless have our opinions in this matter but there are none of us who can justly be accused of being unfair.' His resolve unshaken, Wilson ensures the meeting endorses his note, even as the gulf between himself and his secretary of state grows.